Recently in my Quiet Time, I was looking for inspiration. Having read a devotion about choices, and where they lead us, I decided I would head over to Bible Gateway and memorise and study the verse of today. 1 Peter 3:8 came up. So I started to unpick it…. There are no exceptions here. All of you. 1 Peter 3 starts off with a list of Godly living, within a marriage context, but now he is bringing everyone together. All of you. Man. Woman. Child. We should all obey these instructions. We should be like minded. That’s easy isn’t it? Having similar tastes or opinions. Oh dear, that could be opening a can of worms…I know many Christians who are like minded…. But I am well aware that the Christian community is very divided over many things, and that being like minded is a topic, I feel far too unqualified to cover. So I’m going to move on. This was the part that challenged me, to write this post. 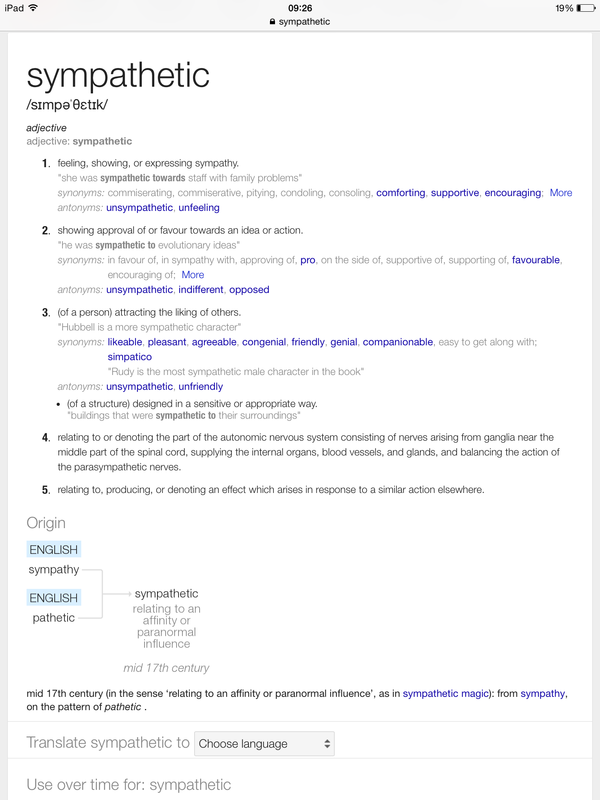 Be sympathetic. We all know the standard definition, but I wondered whether there was more to it. So I Googled it. So definition 1 and 2 are what I expected. But what struck home were the synonyms for Definitions 1 and 3. Comforting, supportive, encouraging. I would love to have people describe me as someone who is comforting, supportive and encouraging. But I’m not 100% sure they would. So the first step, I suppose, would be to develop a listening ear. I must confess that I don’t believe I listen very well, as I seem to be unable to commit things to memory and then recall them at a later date- eg: ” How did the exam go last week?” So I’m challenged to develop my listening skills, so I can become more supportive and encouraging for my family and friends. The synonyms of Definition 3, link back to being more like-minded. Hmmm…. I think this one is pretty self explanatory, especially when we read how we are supposed to ‘Love one another’ in Matthew 22:39. Looking after others, caring for them. Being considerate. Be compassionate. To be caring. Sensitive to the needs of others. To be kind. To not brag about ones own accomplishments. Being truly humble is difficult, as we are all inherently selfish. But what a quality to possess. To be able to live a life reflecting this verse would be amazing. We have been blessed with some examples to read about, look up to. Jesus, of course, was the epitome of these personality traits. He was a leader, yet never bossy, selfish or arrogant. He was kind, caring, compassionate. The Parable of the Good Samaritan is another example, as is the life of Mother Theresa. So the choice that I am going to make this week, is to focus on listening- listening to what has been said, how it has been said, ensure I’ve understood it completely and then (and here’s the biggy) remembered what has been said! What have you been challenged to do? This entry was posted in Good days, Heavenly Matters, Relationships and tagged 1 Peter 3, compassion, Good Samaritan, Greatest Commandment, listening skills, sympathy. Bookmark the permalink.